After all the excitement of Valentine’s Day; the boxes of chocolate, the bottles of fine wine, the inevitable card from your mum…it’s now time to celebrate the far superior holiday of February: Shrove Tuesday (or, its cooler name, Pancake Day). All across the country, people will be dusting off their frying pans, cracking open dozens of eggs and quite possibly enduring the near miss of a bag of flour cascading from the barely used ‘baking cupboard’. But the thought that terrifies me most is the idea of my nearest and dearest picking up a plastic jug of ‘just add water’ pancake batter and hopping into the kitchen with some seriously high expectations. Personally, my idea of a pancake isn’t one that is spewing out additives like a jumbled alphabet. The simplicity of pancakes means few ingredients and the ability to flavour with anything you like, without resorting to plastic bottles of jiffy lemon. The smell of a freshly cut lemon will change your pancake topping ways for good and a simple sprinkling of sugar shows just how easy it is to make pancakes into a sweet little dessert. But what do you think of when the word pancake is mentioned? For me, it’s all a bit of a jumble. What I remember from my childhood Shrove days are a cross between a crêpe and a drop scone; large and inviting, but not thin and crispy. Everyone’s interpretation of the holiday is different, so I’ve provided you with two recipes to satisfy all camps. 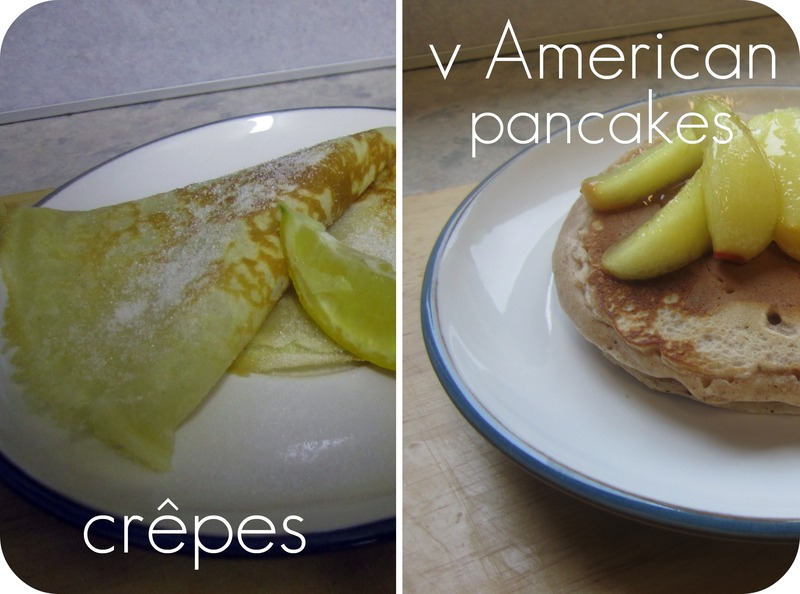 The sweet, crispy crêpes with a delicate topping of sugar are a lighter alternative to my toffee apple inspired stack of fluffy American pancakes. And of course, if neither recipe tickles your fancy, you could always go savoury and try my Warm Spice Pancakes with Crispy Bacon. Whichever version you prefer, just get busy in the kitchen and fill your tummy with some seriously good food. Just stay away from anything in a plastic bottle. It’s what the pancake gods would have wanted. Add the flour to a large bowl along with the sugar and a pinch of salt. Add the egg and the yolk and begin to beat with a wooden spoon. Gradually add the milk until the mixture becomes a runny batter. Stir in the melted butter and vanilla, and leave to rest for 10 minutes. Meanwhile, place a frying pan over a medium heat and grease the pan a little with some extra butter, removing any excess with kitchen paper. Once the pan is hot enough, add a ladleful of batter to the pan and swirl it around until it reaches all the corners. Wait until the batter has cooked on top of the pancake before flipping over with a spatula. Cook the other side until golden and add to a warmed plate. Sprinkle with caster sugar and repeat, until the mixture is all used up. To serve, squeeze over some lemon juice and sprinkle with some more caster sugar. Add the flour, sugar and spices together in a large bowl and mix together with a wooden spoon. Add the eggs, and using a hand whisk, mix until incorporated. Slowly add the milk until you have a thick, but runny batter consistency. Heat the frying pan over a medium heat, and add a dot of butter, removing any excess with kitchen paper. Add a spoonful of batter to the pan and leave to rise, until the top begins to bubble. Flip over with a spatula and cook for a further minute until golden. Remove from the pan and place on a warmed plate or a clean tea towel. Repeat with the rest of the mixture. Once you have finished making the pancakes, add some more butter to the pan and let it melt. Add the apples, remaining caster sugar and leave to cook for 6-8 minutes, stirring occasionally. Once cooked through and syrupy, remove from the heat. To serve, stack up a couple of the pancakes and spoon over the caramelised apples with a little of the remaining juices.